The Collective Security Treaty Organization, the Russia-led political-military bloc, has again failed to find a new leader during a summit that did nothing to combat the growing suspicion that the organization is dysfunctional. The CSTO held its annual summit on October 14 in Yerevan, and the current secretary general, Nikolay Bordyuzha, had said that the group would pick his replacement at the summit. But the summiteers, including Russian President Vladimir Putin, left the get-together without settling on a new leader and without explaining that failure. "We'll get back to the matter in late 2016," Armenian President Serzh Sargsyan said after the summit. But the fact that the new leader is slated to be an Armenian has added some intrigue to the leadership question. Armenia is probably the most loyal CSTO member, with the most to gain -- if a wider war were to break out with Azerbaijan, Armenia could in theory gain the support of its allies. "I don't believe that [an Armenian CSTO secretary general] would have the ability to exert significant influence on the work of the organization. But psychologically -- this would act as a restraint against Azerbaijan," said Edvard Bozoyan, an Armenian analyst, in an interview with Sputnik Armenia. But the Central Asian CSTO members -- Kazakhstan, Kyrgyzstan, and Tajikistan -- have suggested that their sympathies lie more with Azerbaijan than with Armenia, in spite of the CSTO, and it will be interesting to see what changes with an Armenian at the top of the organization. We'll have to wait a little longer to find out, though. This is just the latest in a series of delays: last December a top aide to Putin said that a new secretary general would be appointed by the end of the year, and then the CSTO a few days later said it would postpone that move. Then, in September, information leaked that the new leader would be Seyran Ohanian, then the defense minister of Armenia, but a few days later Ohanian denied the report. So what happened this time? It's not clear, and there haven't been any leaks about the internal proceedings. Armenian analyst Sergey Minasyan said in an interview with news site 1in.am that the most likely possibility was that one of the other CSTO members didn't agree with Armenia's candidate. It's also worth noting that Kazakhstan President Nursultan Nazarbayev skipped the summit, pleading illness. But Nazarbayev has been somewhat cold toward Armenia, "prompting speculation that the illness was diplomatic, Reuters reported. Despite the failure to pick a new secretary general, some things were agreed on at the summit. CSTO leaders approved a ten-year development strategy for the organization, and established a crisis response center and a unified list of terror organizations. Nevertheless, it was clear to most observers that the CSTO is struggling to find a reason to exist. "The CSTO, as a structure, yet again showed its amorphous essence," Minasyan said. "The main result [of the summit] was that the CSTO yet again has difficulty reconciling the approaches and interests and common positions of the member states." Even Belarusian President Aleksandr Lukashenko -- whose country now takes over the CSTO presidency for the year -- despaired about the organization's authority. 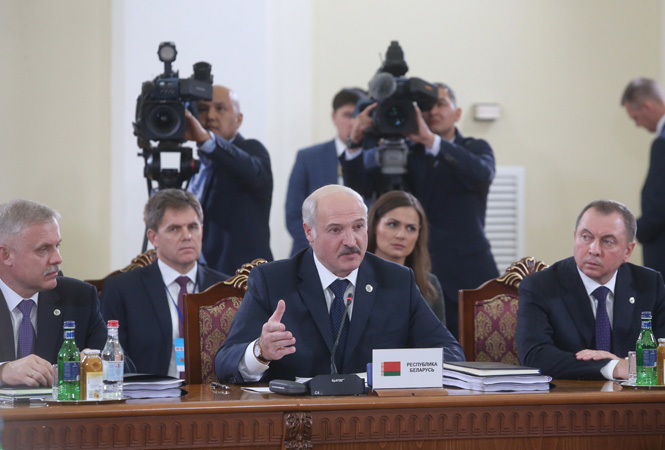 After the meeting, Lukashenko seemed to reference a discussion in the closed session that lamented the fact that the CSTO has little international stature and the fact that it was more talk than action. "For example, we all said here that no one wants to recognize the CSTO, especially NATO, 'Look, the organization is not what it should be' and so on. I heard these conversations, and was thinking, you know, if we ask them to recognize us they're never going to recognize us. We need to act in a way that forces them to recognize our organization," he said. He also seemed to suggest that the summit was a waste of his time. "Honestly," several of the items under discussion "don't reach the level of discussion of heads of state," he said. "To respect it [the CSTO], not fear, but respect, we won't convince anyone to recognize us. So I propose that in the narrow format we don't publicly lay out our priorities, but work them out entirely and then send them to each leader of a CSTO member state."